Some weeks of the year are so busy with farm work of all sorts that we have so much to report here. But as the season progresses, that amount of doingness tapers (much to our relief), and the work becomes more steady and sure. This week, the farmer spent most of his time harvesting those summer crops that do best when checked daily, like the summer squash and beans, so that they don’t grow too big. And when he wasn’t doing that, he was continuing to sow fall/winter crops and transplant fall/winter crops. Weed pressure is now slowing down for the year, but I did manage to weed most of the strawberry patch we planted in the spring. This spot kept getting put aside while we weeded crops we were actually harvesting now instead of a year down the road. Experience has taught us, though, that taking care of your fruit plantings well from the beginning will be rewarded. It felt good to liberate those beautiful strawberry plants, and will be well worth it next year! Other than that, my mind wanders far from farmwork most days, thinking about the millions (it feels like) of home repair projects I would like to have finished before the baby comes. It is nice to finally be into August, where I can feel pretty good about spending more time working inside than outside, with most of the busy work of farming done, and the farmer able to concentrate on the harvest. 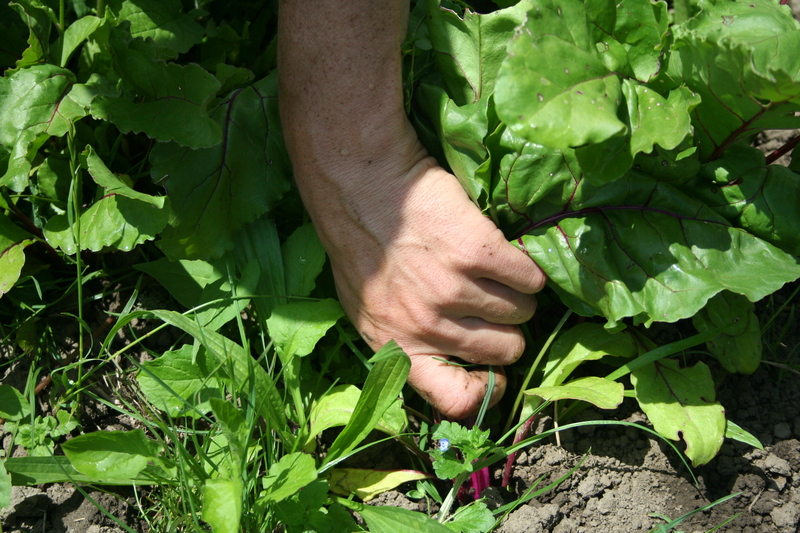 Pulling good food from the ground in abundance will be the main work of August, September, and October. Then we will slide into those quiet cold months again. Time marches along so quickly, but the rhythm of its beat is at least predictable here on the farm. Fast and furious in the spring, busy and wild into summer, when suddenly it becomes steady and predictable like our heartbeats, until it quiets into a gentle hum in winter. It is a beautiful song, we love to live it over and over again each year. ← A bit of red, a bit of looking ahead.